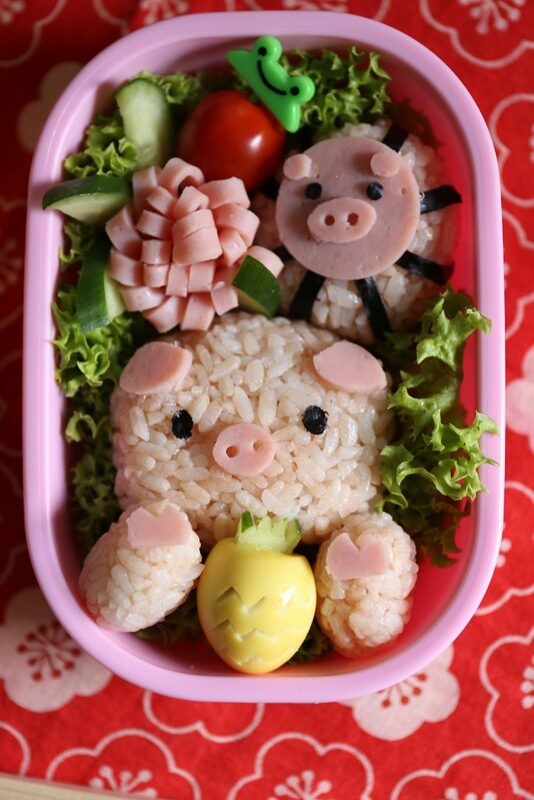 Rice – for Piggy’s face 50g, for hands 7g each and 10g for the ears. 1. Place lettuce in the bento box to make a lettuce bed. 2. Form a rice ball to make the piggy’s face (50g), and 10 g each for the hands and roll the balance to form another rice ball. 3. Cut out slices of cucumber to form leaves for the pineapple and for the flower. 4. Cut the zig-zag pattern on the surface of a boiled quail egg to make the pineapple. 5. Cut out a bit of the bottom of the egg to slot the cucumber that has been cut out as a shape of the leaf into it. 6. Cut the ham into 2 and use half of it to make a flower. Bend the ham vertically in half and make cuts about 2/3 from the closed side of the ham leaving about 3 mm between each cut. Then roll it up from the edge and pin with a strand of pasta to secure it. 7. Cut the ear of the pig with a large bubble tea straw into oval shape and attach to the top side of the piggy face rice ball. 8. Cut the shape of the nails and the stout from the ham and attach to the top of the hands and face respectively. 9. Cut out the eyes from Nori using a Nori cutter and attach the eyes to the main pig face. 10. Cut the nori into 5mm strips and prepare 3 strips. 11. Roll the rice ball with them as pictured. 12. Cut out the circle shape with a small cup from the ham and use it for the face of the other mini pig. Cut out the ham with a straw to form oval shape to make the nose of the pig. Make 2 holes on the stout. 13. Cut out the nori to make the mini eyes of the pig. 14. Place a mini food pin to decorate the cherry tomato. 15. Assemble and neaten everything to have a good balance of the bento.